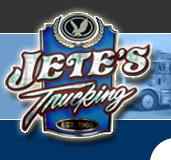 In order to accommodate our customers growing needs, Jete's Trucking has recently purchased 9.5 acres of land which will enhance the services currently offered by Jete's ie: container storage, tractor parking. We will be conveniently located across from Fraser Surrey Docks, with quick and easy access to all Lower mainland ports and highways. We're excited about this move and want to share our new site's progress with you. Check back often to watch us grow!